Ahoy there me lads and lassies! It’s me again, your app pirate, bringing you me latest finds from the seven seas and beyond. When diving down the ocean looking for booties, me and the crew met mermaids that guarded their precious pearls. Ye might think that this old salt took their pearls, aye? But no, they became our friends so we didn’t get them. Ye see, this bucko also has a heart. Har, har, har! The app that I will share with ye today is connected to that. 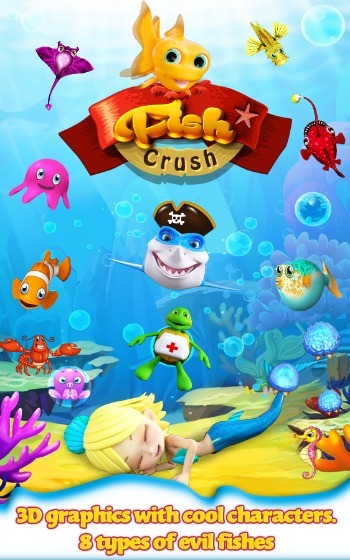 It’s an arcade game called Fish Crush from ASQTeam. Avast ye and let’s start with the review. The game has colorful graphics, although it’s more like it was designed for kids. Graphic-wise, kids would be more attracted to it than adults. There are different kinds of fishes in the game, which is good as you wouldn’t just be looking at the same creatures over again. The sound effects are also nice as they add to the life and excitement of the game. You would hear distinct sounds when the fishes attack and when you hit them. There are advertisements, although they do not really cover the whole game window so you might be able to live with them. There’s an introduction about the story behind the game, which is good as you would not just be playing but you would know the main reason behind it. The bad fishes are trying to steal the pearl of the mermaid and you need to stop them by tapping on them. While this may sound easy, the twist makes it more challenging. There are friendly fishes that you should not tap as this would cost you to lose points or the game to end. This is difficult especially when the game gets faster and several fishes are coming from different directions. This is another good side of the game. Its four different modes include Story, Survival, Time and Protector. This would keep the game interesting as you could switch from one mode to another in case you get tired of one. Aside from the challenging levels and different modes, another thing that would challenge you to get a better score and do good in the game is the leaderboard. You would be competing with the other players from around the globe to be on top of the list. It has nice graphics and sound effects. It’s easy to play but has a twist that makes it more challenging. The leaderboards and different game modes make it even more interesting. There are advertisements, although they do not cover the whole screen. It’s only available for Android as of this writing so if you’re using iOS, this may not be the game for you. 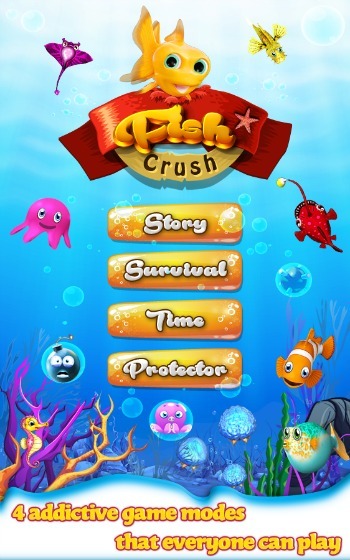 If you are an Android user and you want a game that is challenging but doable and would keep you playing for hours, you should download Fish Crush and give it a try. It’s free and fun, and would keep you occupied, especially the kids.